At the end of summer in 1962, I packed some clothes and art supplies in a bag and rode the bus from Cleveland to Mexico City. People there said that there were a lot of artists in San Miguel de Allende. So after a week in Mexico City, I took the bus to San Miguel, settled in for 10 months – did 50 paintings – and then at the end of summer in 1963, moved to New York. I worked in a sign painter's supply shop, studied, ground litho stones at the Pratt Graphic Art Center, and painted in my apartment on the lower east side. I moved back to the midwest and taught for three years, as the Vietnam War was escalating. I moved back to New York in 1967 and found a loft a block south of where the World Trade Center was being built. Three years later, as the Trade Center came to loom past my window, I moved to my present location on the Bowery. At that time I had my first show in New York in SoHo, at Paley and Lowe. My father died. I left the gallery, revised my ideas about painting, and drove a cab at night for four years. During that period, I began my 15 years of seeing a therapist. She was my "professional friend". I told her that I felt like I had one foot nailed to the floor–she taught me to dance. I threw away my cigarettes forever and replaced cab driving with teaching. Doing 50 paintings in Mexico wasn't an MFA, so I enrolled at Hunter College and earned my Master's Degree in 1979. My art teaching career built slowly with a vengeance: by the early 80's I was teaching eight classes in seven different places! I was asked to teach a multi-media (anything but painting) course at the Philadelphia College of Art. To prepare for the course, I began doing my own multi-media projects as site specific installations with "work gloves". In 1984 I was invited to teach in France at the Lacoste School for the Arts. While there in 1985, instead of painting the Provençal landscape, I began a series of "work gloves embedded in pattern" watercolors. The series continued to develop into large canvases after I returned to New York. Something wasn't right with these paintings. To refresh, I tried Landscape again–this time while sharing a little house in the Catskills, painting out of doors in the summer. I decided to limit my teaching to one place, City College. And, giving up the house in the Catskills, my landscape painting evolved on the Bowery into the abstract patterned paintings that I am doing now. 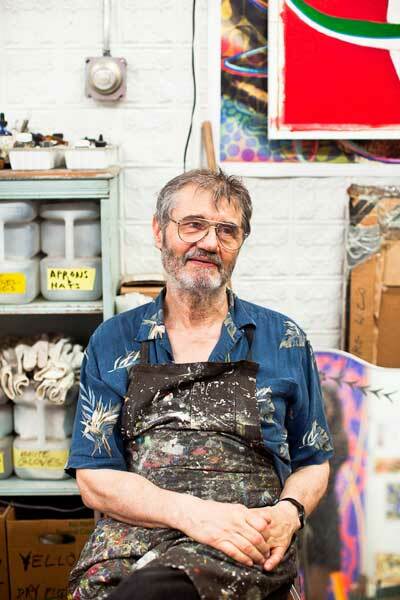 Fred Gutzeit in his studio in the Bowery, NYC.